We’re in the middle of another 18-month celebration here at Yester World. This one is called the “Happiest Celebration on Earth.” It began on May 5, 2005. The castle on the banner looks like the one at Disneyland, but technically this is not a celebration of the 50th anniversary of Walt Disney’s original Magic Kingdom. 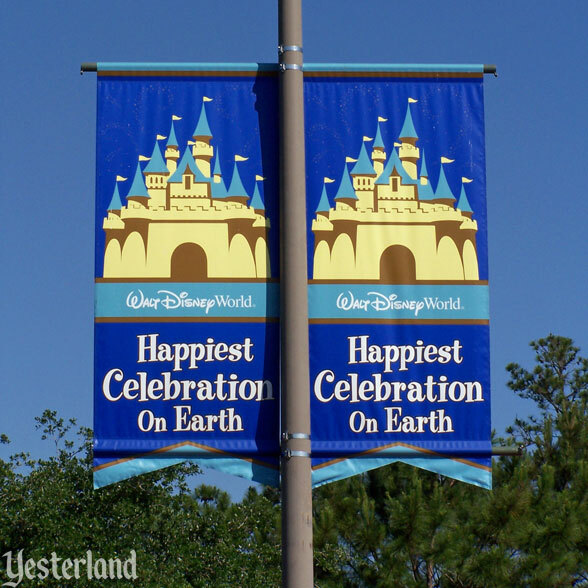 Here at the Magic Kingdom of Yester World, the “Happiest Celebration on Earth” is an “18-month salute to 50 years of Disney theme parks.” That’s the official explanation from the PR department. Here at Yester World, the centerpiece of the celebration is Cinderella Castle. 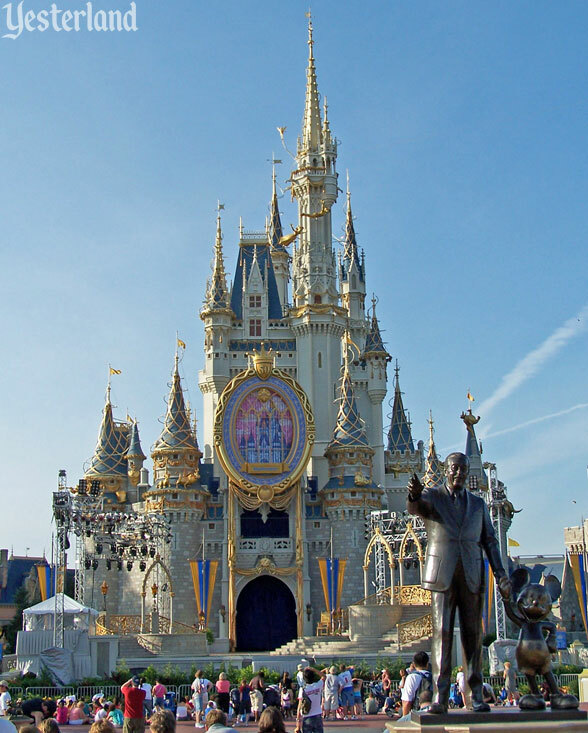 Despite its complicated architecture, the fairy-tale castle is elegant. At 185 feet (or 189 feet or 190 feet depending on the source), its towers soar much higher than those of the European castles that inspired the design—or the 77-foot-tall Sleeping Beauty Castle at Disneyland. 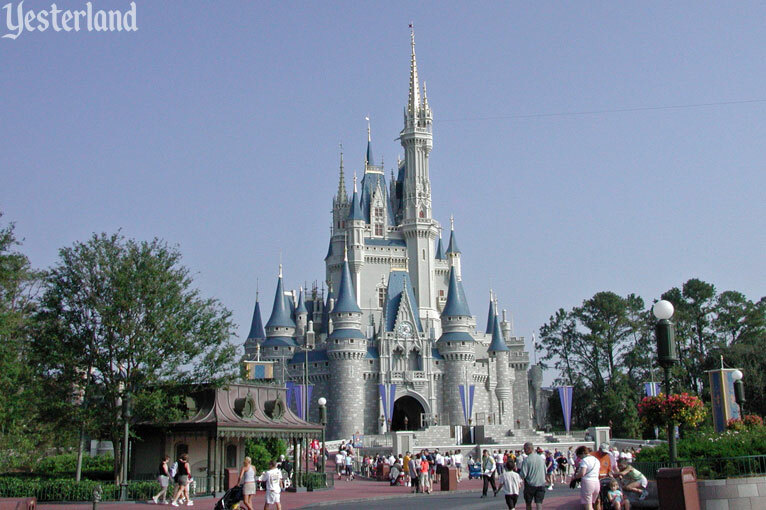 But for the “Happiest Celebration on Earth,” Cinderella Castle temporarily has a bejeweled look. 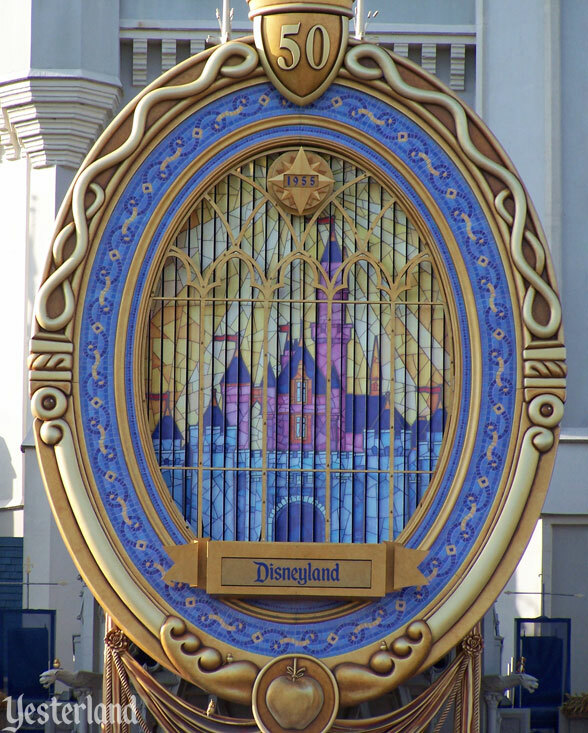 Scheduled to debut officially in ceremonies at the Magic Kingdom theme park on May 5, 2005, the stylish transformation is inspired by the works of Renaissance artisans of the 15th and 16th centuries, while also paying tribute to the rich legacy of Disney animated films. 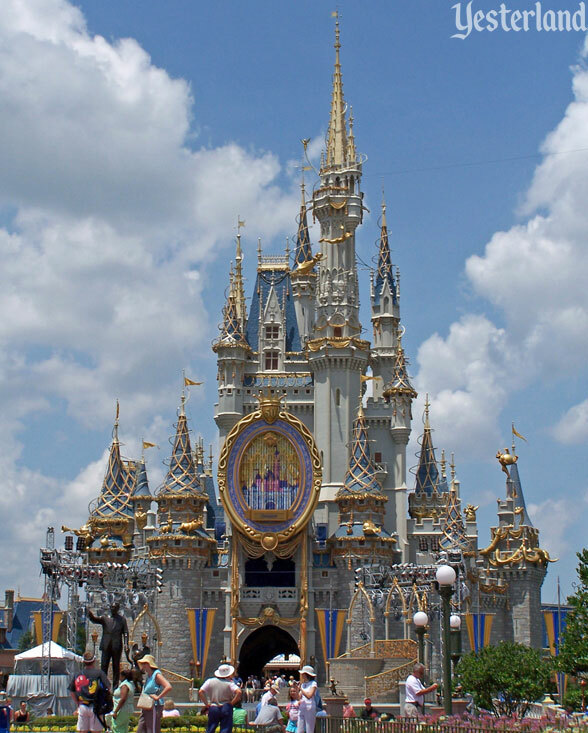 As part of the 18-month salute to 50 years of Disney theme parks, Cinderella Castle at Walt Disney World Resort will be decorated with graceful touches of golden trim, rose swags, bunting and swirling bands of “pixie dust” encircling its blue spires. “Elegance and style” are in the eye of the beholder. The most prominent jewel on the castle is an enormous golden frame above the front arch. 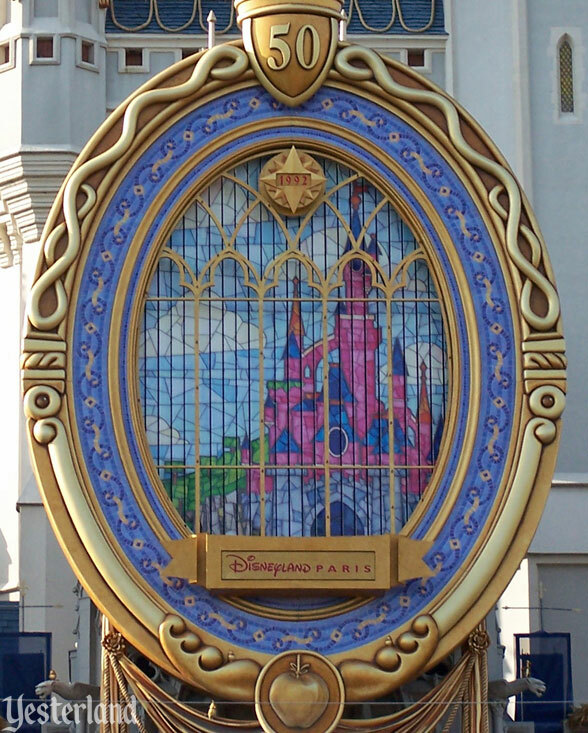 With its tall oval shape and art nouveau details, the Magic Window is reminiscent of the Evil Queen’s Magic Mirror from Snow White and the Seven Dwarfs—but that’s a different story, and there’s no menacing face here. The image in the frame changes every minute. 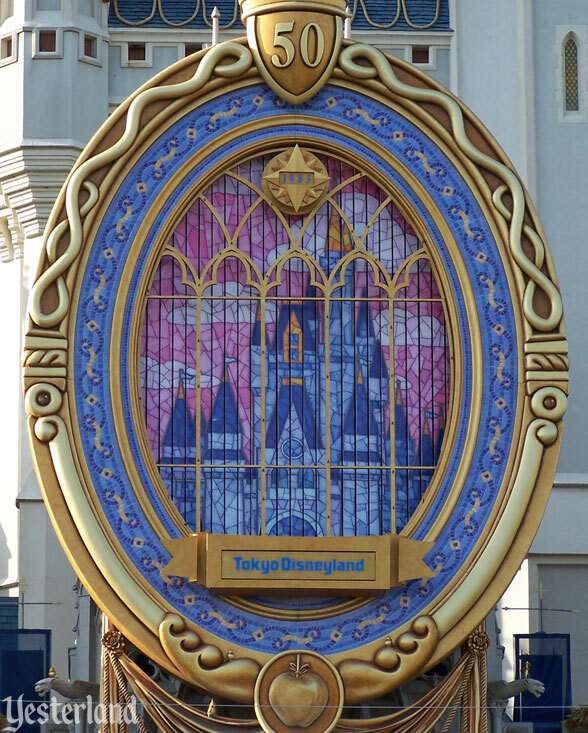 Each of the five iconic castles from Disney theme parks across the globe is rendered in a stained glass-style, accompanied by the year the park opened and its name. There are only four close-up photos above. Walt Disney World appears to be missing. But it’s really there. That’s because there are only three castle images, not five. Look closely. 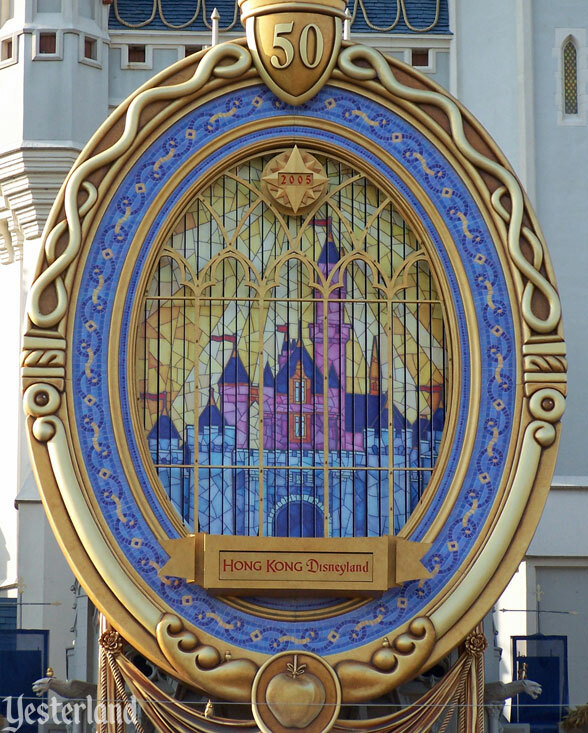 Disneyland and Hong Kong Disneyland use the same image; even the sky is identical. 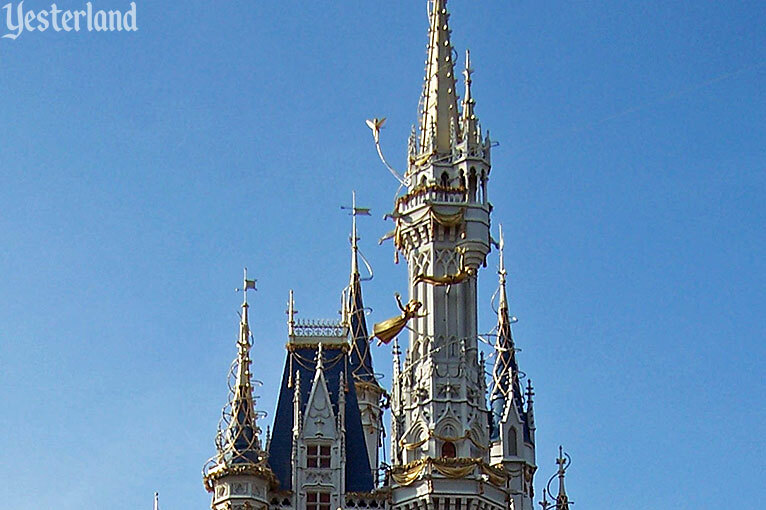 Along the same lines, Walt Disney World and Tokyo Disneyland share a castle image. Again, only the year and the park name are different. The images are on three-sided vertical elements that rotate to three positions. It’s a good thing that two pairs of parks each have essentially the same castle; otherwise the old three-position rotating billboard trick would not work. 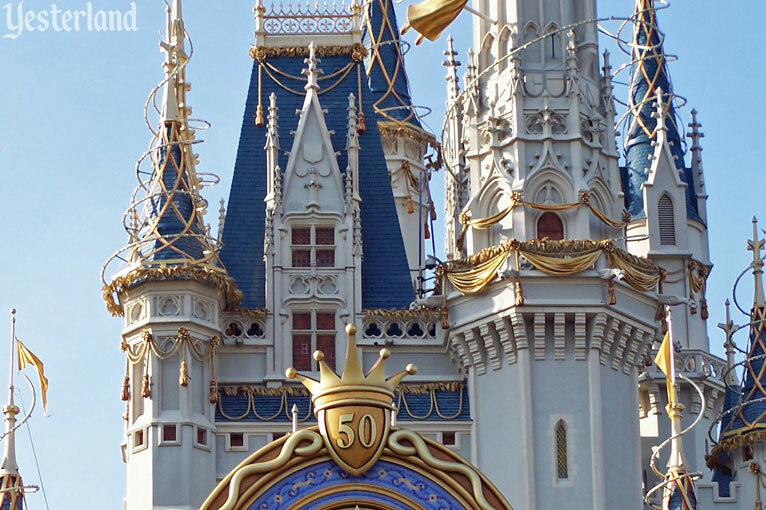 The castle’s turrets, towers, and balconies are festooned with golden swirls, bunting, and tassels. Okay, it’s all a bit gaudy. 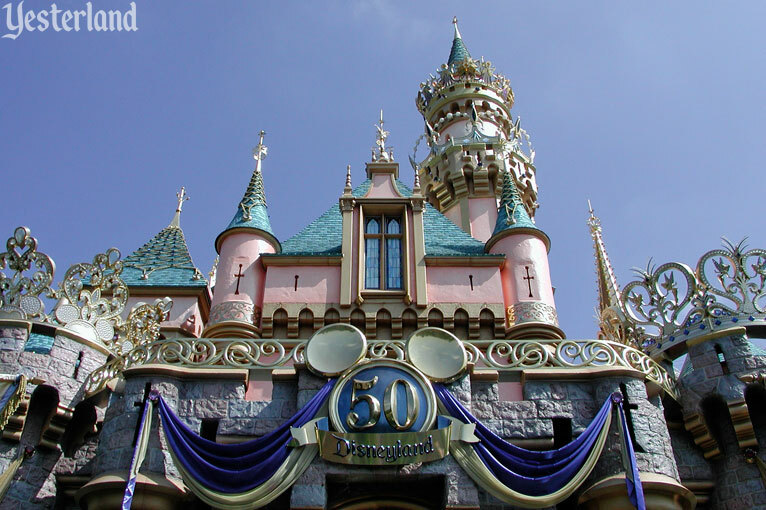 But the 50th anniversary of Disneyland really is a milestone worth celebrating—even if the official reason doesn’t focus on Disneyland. It was called the “Happiest Celebration on Earth” at Walt Disney World and the “Happiest Homecoming on Earth” at the Disneyland Resort. At both locations, the 18-month event ran from May 5, 2005 through September 30, 2006. 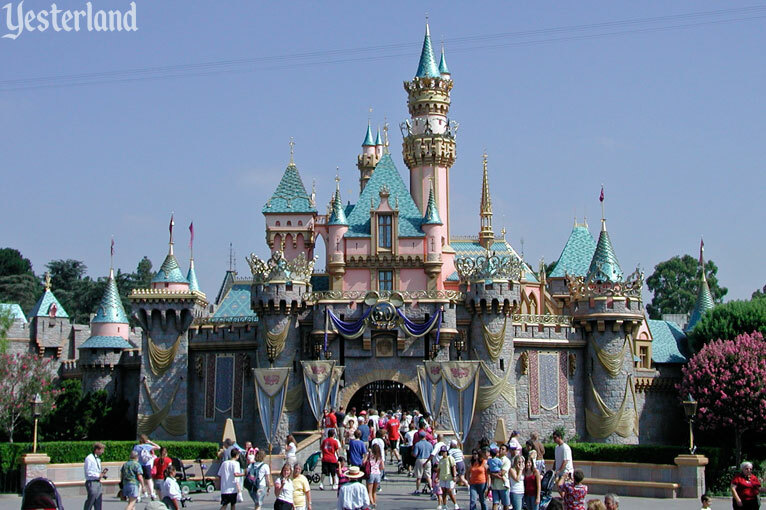 Disneyland’s smaller castle was also decorated for the occasion, but without the swirls and sculptures—and without the Magic Window. There was far more to the event than just decorated castles, but the castles are the focus of this article. 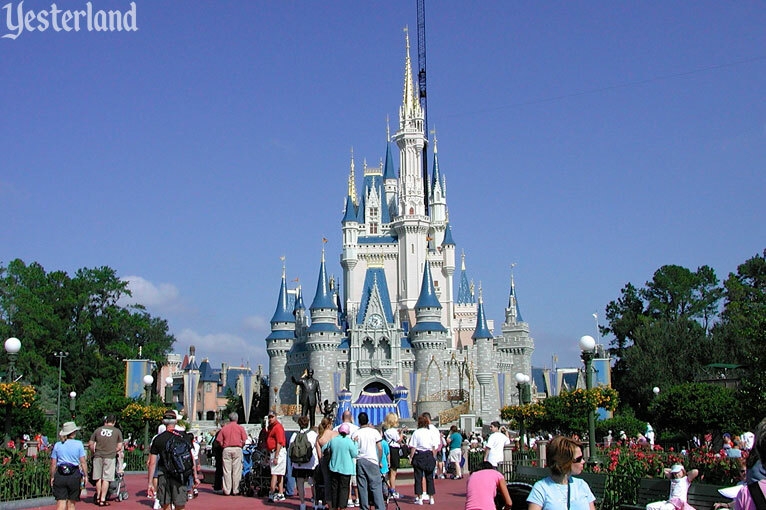 The overlay on Cinderella Castle was removed promptly at the end of 18 months. 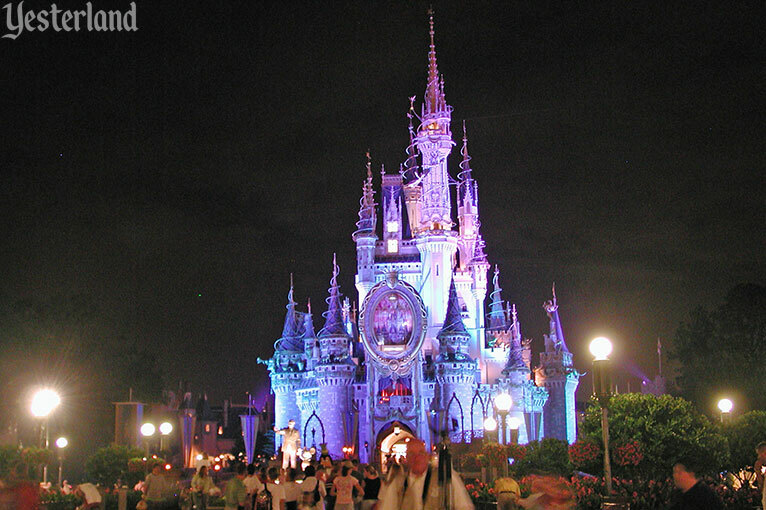 By the 2006 Holiday season, not a trace was left—except the stage for “Cinderellabration” which continued to be used for other castle forecourt shows. 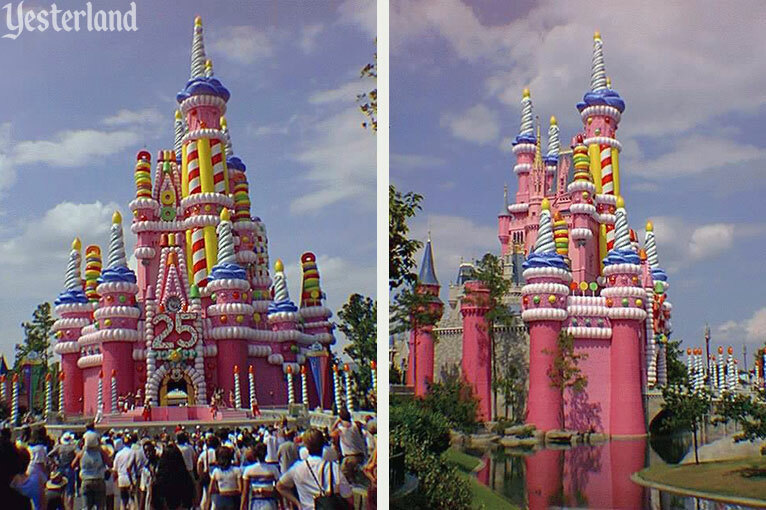 As castle overlays go, the one for “Happiest Celebration on Earth” was not nearly as objectionable as the pink “birthday cake” for the 25th anniversary of Walt Disney World.